¡Mira! Look what the flamenco guitarist bought me this weekend in Santa Barbara! 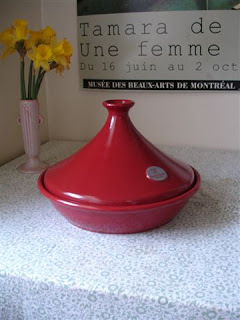 A tagine! And such a lusciously curved specimen. And in such a deep shade of coral. It's like art pottery...but functional! Oh baby, this raises the bar on my Pesach seder significantly. This means that something lambish will definitely be on the menu. I can smell it now...even though I'm not sure what's going to be in it yet. Eight adults and seven kids are coming to my second-night seder. I don't even have eight chairs for the grown-ups. Much less seats for seven kids and one more for Elija, who's supposed to bring the matzo-ball soup. I suppose this really will be a night unlike any other night. And on this night we brought our own chairs to the seder table. And reclined upon ornate cushions, which were provided by our winsome hostess, and were pleasing to the eye, and to the buttocks. For she is in possession of many fine cushions and other frivolities such as teapots and tea glasses and coral-colored tagines. Alas, she is sorely lacking in furniture. Now I'm on the prowl for Moroccan lamb dishes. I betcha the gorgeous Clotilde at chocolate and Zucchini has some. Wonder if she's going to be in California in early April. She'd have to bring her own chair, though. In any event, I'll find something, probably something with cous-cous, since I can't actually use grain on Pesach, and have a test run with the tagine. Tony gets to sample the output. He doesn't have to bring his own chair, unless he wants to. I'm very jealous! I want one of those!